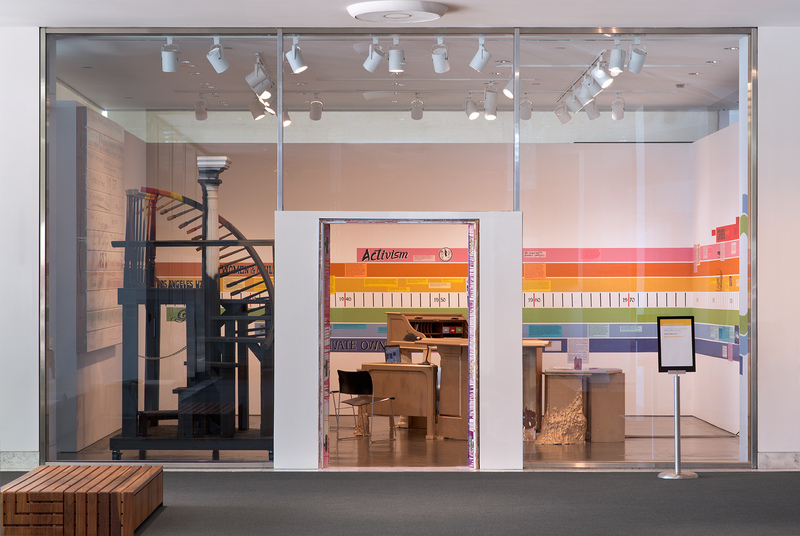 Dream Home Resource Center, Olga Koumoundouros’ most recent installation, has put a bump in the proverbial road of museums across the city paying homage to Pacific Standard Time’s recognition and celebration of residential architecture in Los Angeles. But it is a bump that the Hammer Museum is more than proud to host since Dream Home Resource Center has come to serve as the raw, not-so-glamorous addition to the otherwise sleek and glassy buildings a part of Pacific Standard Time Presents: Modern Architecture in L.A. Despite its welcoming vibe, donning rainbow doors and furniture painted gold, Dream Home Resource Center doesn’t scream sunshine and good times so much as it reveals the seedy underbelly of housing in Los Angeles. It boasts a timeline that wraps around its walls with facts and significant events including the notorious housing crisis. The center of the installation hosts a powder blue plushy office chair where Allison Agsten, curator of public engagement at the Hammer says, “…an expert sits daily and dispenses free information about housing.” And just to the left of that rests a black, spiraling staircase that Koumoundouros climbs in a very Tim Burton-esque fashion once a week to write a new statistic about the housing market. Last Wednesday, Agsten led a Lunchtime Art Talk on the installation. Agsten told us how in the process of curating this installation, she learned more about Los Angeles housing than she could’ve imagined. “This is the most ambitious project I think we’ve ever taken on!” She explained how in her research, she read books on everything from squatting to foreclosure. 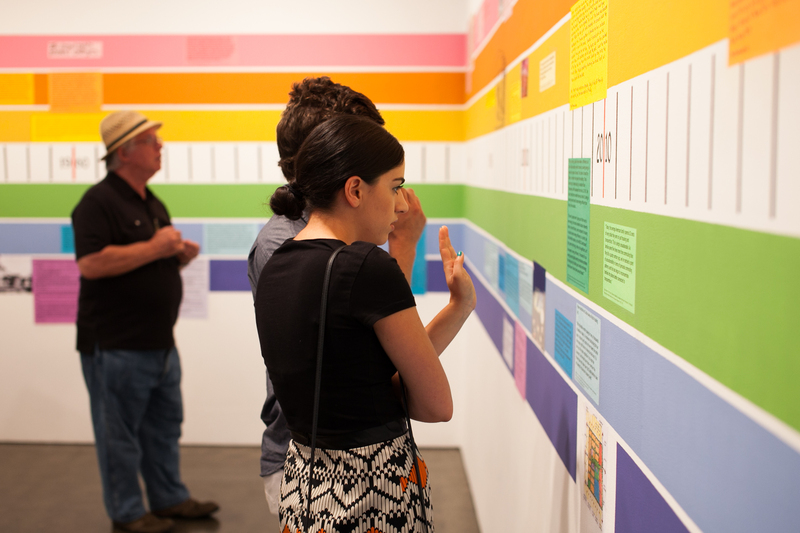 And while visitors won’t find themselves flipping through hefty housing law manuals, the installation does offer a space that facilitates dialogue on subject-matter one doesn’t traditionally expect to discuss on a trip to the museum. “This [Dream Home Resource Center] provides opportunity for a rare intimacy you don’t normally experience in this kind of place.” Agsten beamed before moving on to discuss how each item made its way into Koumoundouros’ installation. 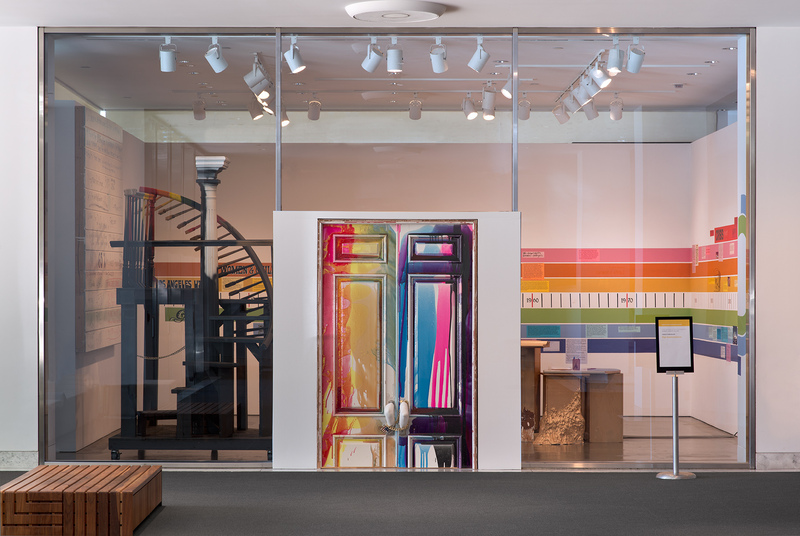 The aforementioned rainbow-streaked doors remain propped open and invite visitors into the installation. But prior to landing this sweet gig, these doors resided in Orange County, attached to a McMansion on Golf Club Drive. 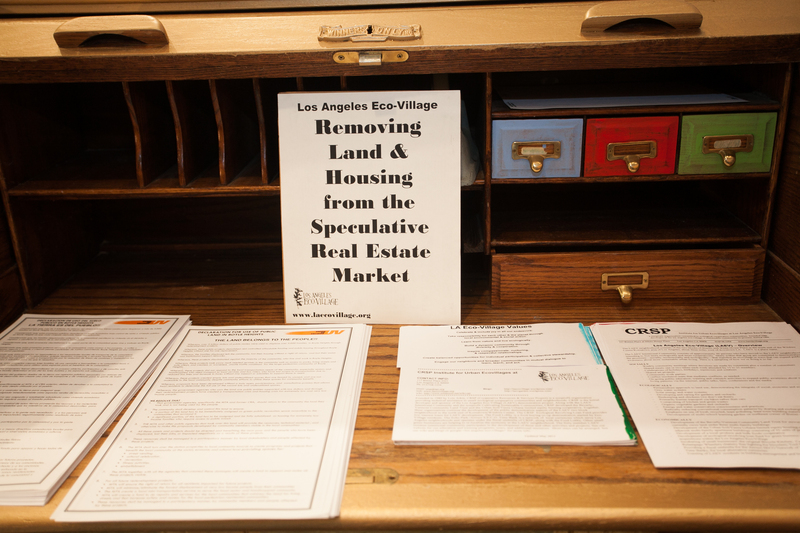 Agsten emphasized how that very street name, Golf Club Drive, demonstrations just how wide the gap is in the Los Angeles housing circuit. Residents of Gold Club Drive live on one end of the spectrum and, just a short time ago, Koumoundouros was on the other end. A Notorious Possession, Koumoundouros’ last housing-related installation created a lot of buzz. For that multi-staged project, she occupied a vacant house in Glassell Park, painted the exterior gold, splattered rainbows on the walls of the interior, and even staged performances in the backyard—exploring the concept of “home” and hoping to underline just how hard the economic crisis hit Los Angeles. “Olga brought the vernacular of that work here with the centerpiece painted gold and the rainbow walls,” Agsten said, speaking to the influences of A Notorious Possession on Dream Home Resource Center. Bringing Dream Home Resource Center to the Hammer was definitely a collaborative effort. Allison Agsten and curatorial assistant, Sohrab Mohebbi worked closely with Koumoundouros as did the talented sign painters who helped bring her vision to life. And Interior Removal Specialists Inc (IRS), an organization that prides itself in its eco-friendly demolition, dumpster services, labor services, and construction cleanup, assisted in bringing the furniture to the installation site. “Just hours before the show, she [Koumoundouros] felt like her hand was missing—I came down and she had her foot propped up and was sketching it on the wall.” Agsten pointed towards the foot and (later sketched) hand that rest on the back wall portion of the timeline. Koumoundorous has made the concept of “home” her life’s mission to explore and now she invites visitors to do the same. Dream Home Resource Center opened in the Hammer’s lobby gallery on June 21, 2013 and the rainbow doors close on August 18, 2013. Admission is free.